In the section O Eco Pioneers! Three urban development projects transforming modern environmentalism. A South Bronx native brought sustainability to New York City's blighted borough, and revived it from the ground up. 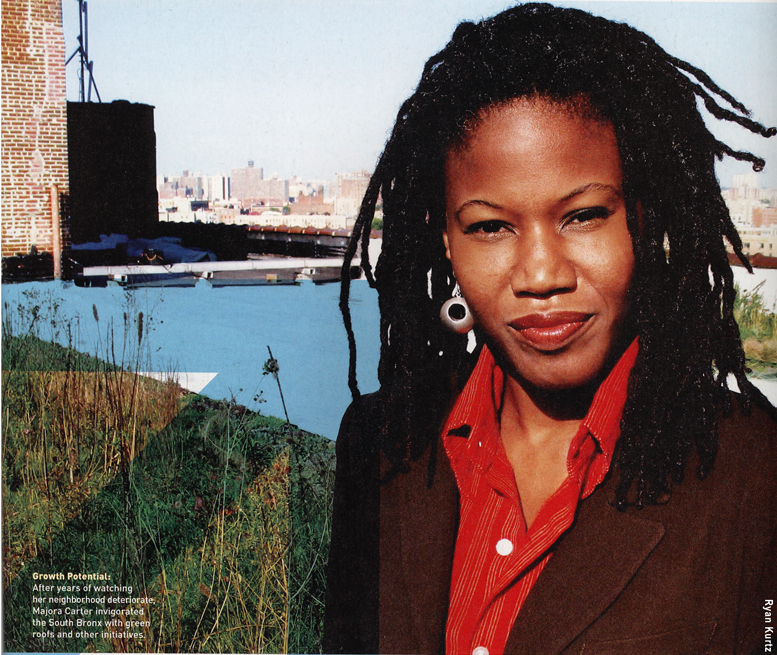 Get this straight: Majora Carter is not anti-development. "I've embraced my inner capitalist," says the 40-year-old founder of Sustainable South Bronx, a nonprofit dedicated to improving life in the borough through green means. "I believe that sustainable, community-friendly development can also make a fortune." Carter won a MacArthur Foundation grant in 2005 for this belief and her work, to, as she puts it, "green the ghetto." She grew up in a house that her father bought in 1948 in what was then a predominantly white, middle-class neighborhood. By the mid-1960s, however, the face of the South Bronx was changing. In 1963, Robert Moses, the city's grand poobah of urban planning, plowed the Cross-Bronx Expressway through the borough, displacing more than 600,000 residents. As a child in the '70s, Carter watched as her neighborhood became a national symbol of urban blight. Banks redlined the area, neighbors moved out, and industrial plants moved in. "I watched 50 percent of my neighborhood burn down -- blocks and blocks of structurally sound buildings were just gutted," she recalls. Soon Carter also left, to study film at Wesleyan. In 1997, after completing an MFA at New York University, Carter moved back home. The scene was grim. Major industries had overwhelmed the neighborhood, bringing more than 60,000 diesel truck trips through the South Bronx per week and creating one of the highest asthma populations in the entire city. "No one wanted to be here, but people couldn't afford to leave," she says. When she heard about the city's plan to build yet another waste-transfer station in the area, she fought back and contested the proposal. Three years into the battle, she won. After leading that charge, Carter knew she had found her cause, and in 2001 she founded Sustainable South Bronx (SSBX), a nonprofit that undertakes everything from green roof installation to "green-collar" job training in sustainable development. SSBX's seven staff members launch projects like the South Bronx Greenway, a network of bicycle and pedestrian paths along the waterfront. They also prototyped the Bronx Environmental Stewardship Training (BEST) program, a 12-week intensive begun in 2003, that offers instruction in natural resource management and prepares participants for living-wage jobs with growth potential. Of the 40 BEST graduates – most of whom never graduated from high school and receive some form of public assistance – more than 80 percent have gotten jobs in sustainable-development positions. "These are people who have both a financial and personal stake in the environment," says Carter. Carter's goal is to connect environmental health, well-being, and economics in people's minds. "I’m pushing environmental justice for what it is – an extension of the civil rights movement. I'm not considered the best voice for the environmental movement, but I add color to this conversation in ways people don't expect." I told my fiancé straight up—no public engagement crap. If you put my name on a Jumbotron, I will say no. Mind you, Chris and I had already decided to get married. Our egalitarian engagement felt right, but we missed the element of surprise. Plus, my great-grandmother's ring was waiting for me, and I hoped he'd ask my mom for it. One Saturday in May, Chris handed me a note that began, "Your mission, should you choose to accept it…" Then he walked out, and I walked into a well-plotted treasure hunt through my favorite New York City haunts – Mayrose Diner, Veniero's (an Italian bakery that serves my favorite napoleans), Other Music, and the Strand. My dearest friends, who had flown in from across the country, were the treasures at every stop, and each person had a pre-written clue to give me that would lead me to the next destination. The tour finally landed me at home, where Chris was waiting with a small black box and my family ring. After that day, my usually skeptical mother started saying, "If you don't want him, I'll take him. Copyright © 2016, Jennifer Gandin Le. All rights reserved.